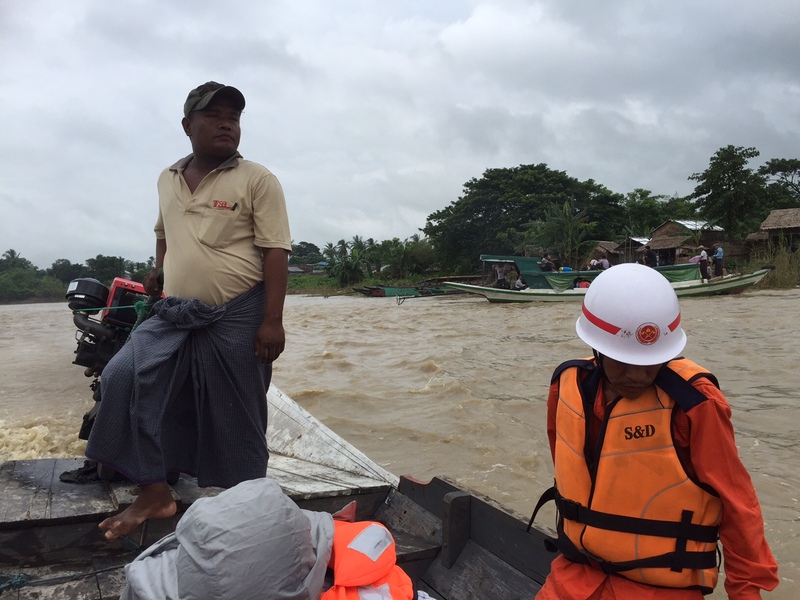 2015 Myanmar Torrential Rains and Floods Damage Assessment at Irrawaddy River Banks – Weathernews Inc.
Weathernews Inc. extends our heartfelt sympathy to all affected by the floods in Myanmar. 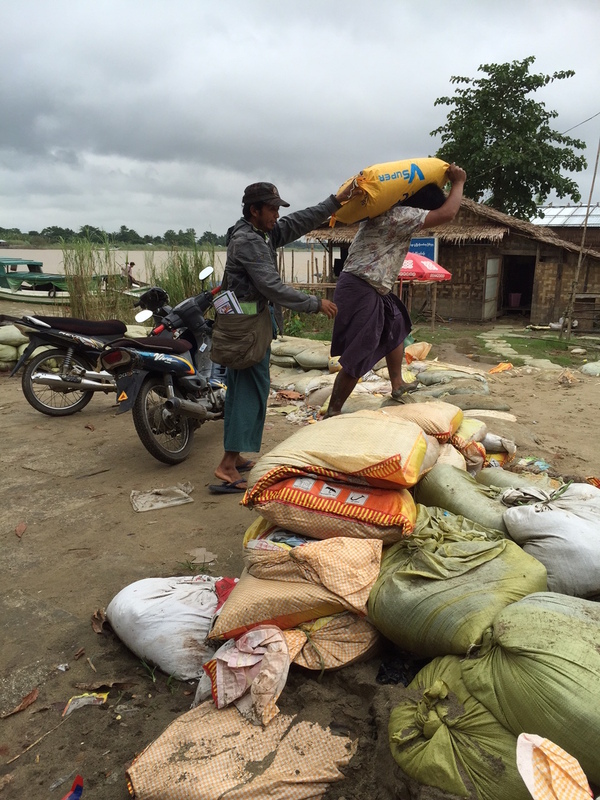 Monsoonal rains starting from July in Myanmar and the effects of a tropical cyclone that made landfall over neighboring Bangladesh have caused Myanmar’s Irrawaddy River to overflow, and cause widespread flooding and landslides in the country. Weathernews has worked under the corporate principle of wanting assisting people in times of emergency, so with this spirit, we made an assessment of the damage in affected areas, and have released a special Myanmar Rain Disaster Information website to help people the of Myanmar minimize secondary disasters and support recovery operations. This URL can be viewed on PC and Smart Phones To access from Smart Phones, please download the Sunnycomb application. Special content on the disaster area can be found under Notifications. 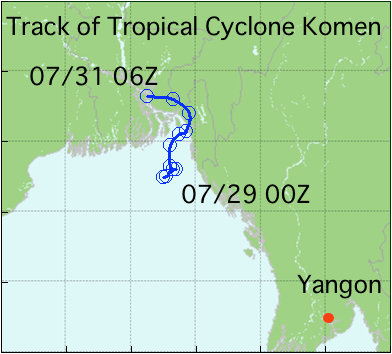 Monsoonal rains since July and torrential rains caused by Tropical Cyclone Komen making landfall over Bangladesh on July 30th have caused mountainous areas in western Myanmar to receive up to 500 millimeters of rain in one month based on Weathernews analysis of satellite data. The estimated rainfall events show that compared to August 2015, there was an area of rainfall over 500 millimeters (represented by the red area on the map in Fig. A) in western Myanmar in July 2015. 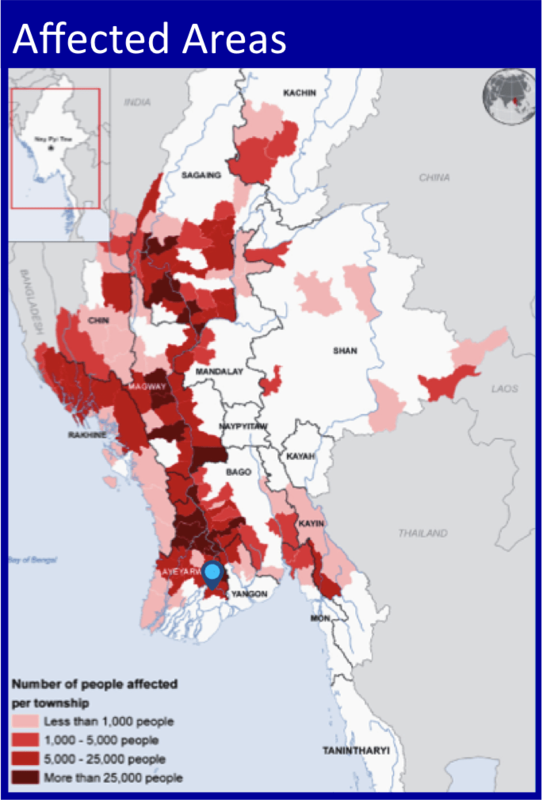 Three major cities in Myanmar (Mandalay, Sittwe and Yangon) also showed that July 2015 yielded 1.6 to 2.0 times more rain than normal. 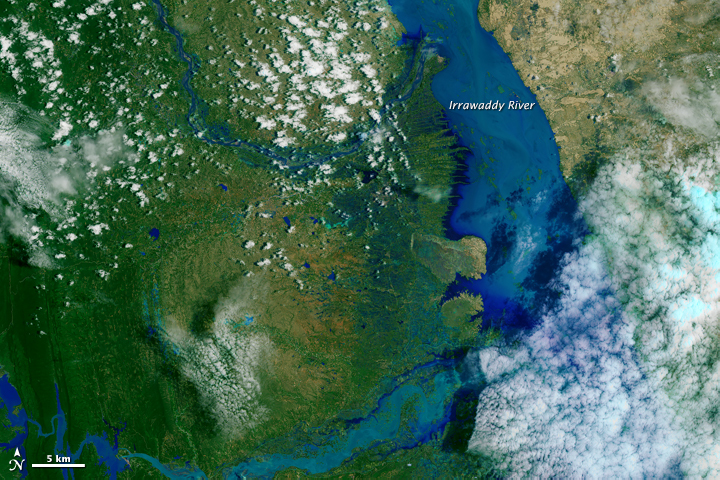 The rainfall produced by the monsoon and cyclone flowed into the Irrawaddy River caused widespread flooding and landslides downstream. 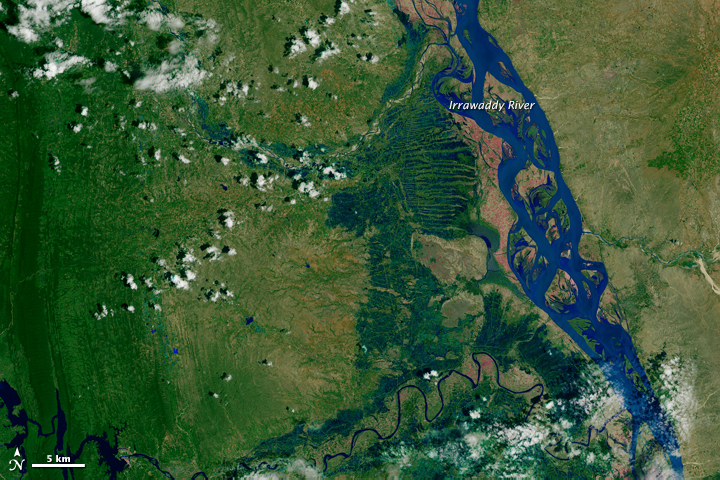 NASA satellite images show much land is underwater in August 2015 as compared to August 2013. Source: Generated by OCHAn(13 August2015) based on datanfrom RRD and MIMU. 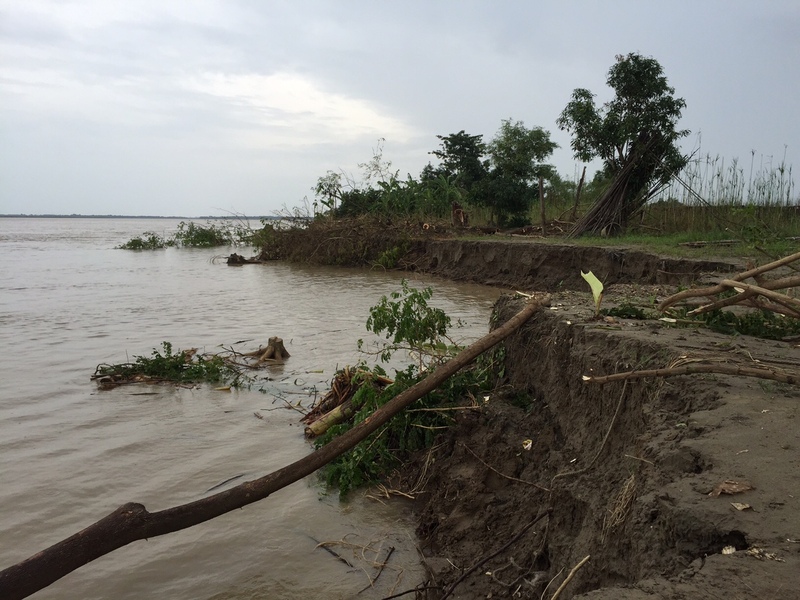 In order to assess the damage, Weathernews staff visited the coastal area of the Irrawaddy River near Nyaungdon, which is situated three hours northwest by car and boat from the city of Yangon. Most of the water has receded, but there are some places still inundated, and littered with driftwood. Full recovery of the area and daily life is expected to take a long time. Watermarks on outer walls of houses shows the water reached up to one meter. Land collapses in some areas show widespread dangerous situations. A coastal elementary school also collapsed. 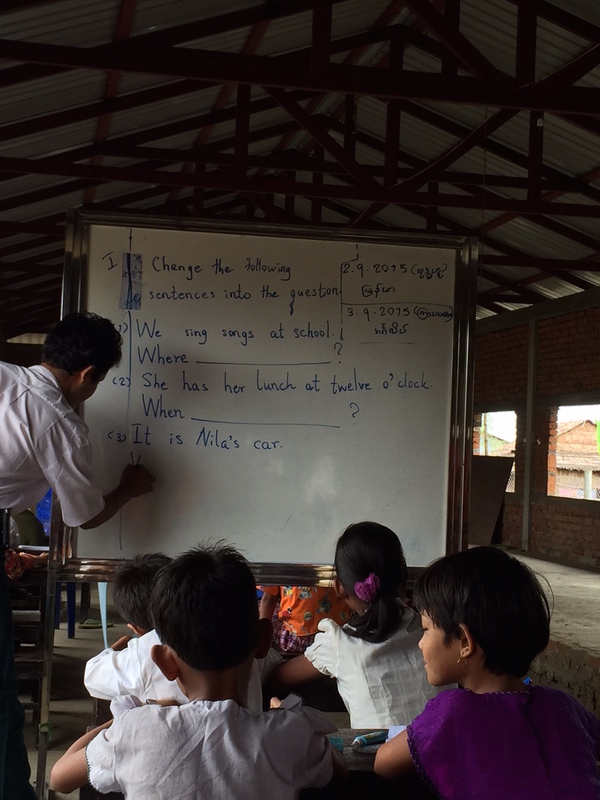 Children are taking classes in a temporary classroom in an unaffected building nearby. 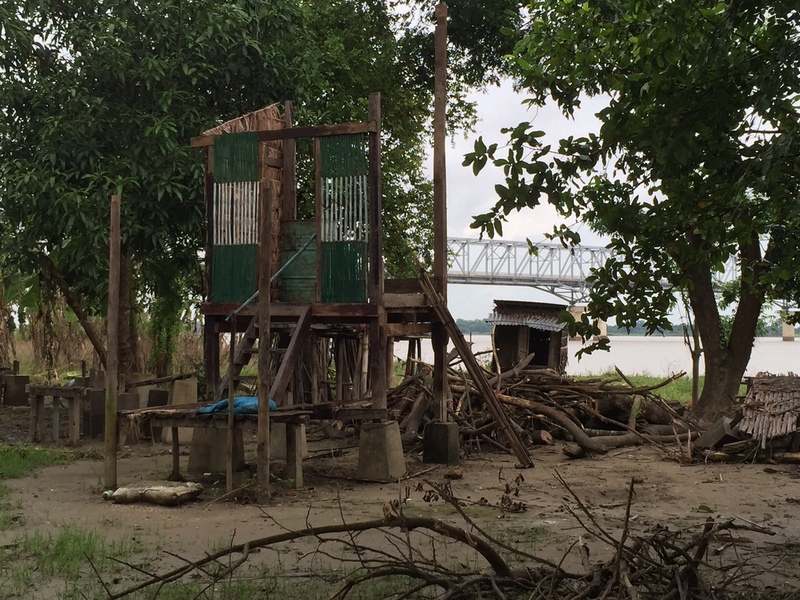 As of August 27th, the Irrawaddy River water levels are slowly decreasing, but they are still high and needs careful monitoring based on weather. 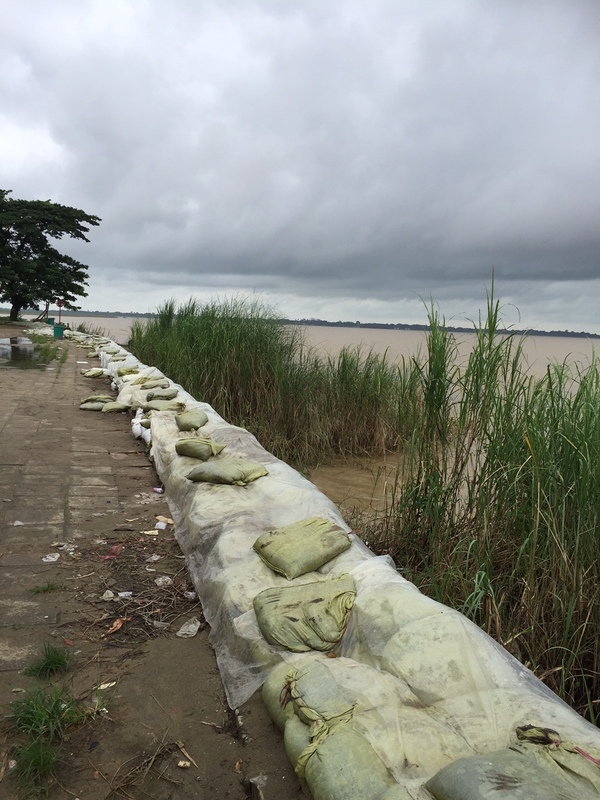 To minimize further impacts, sandbags are placed around the area. 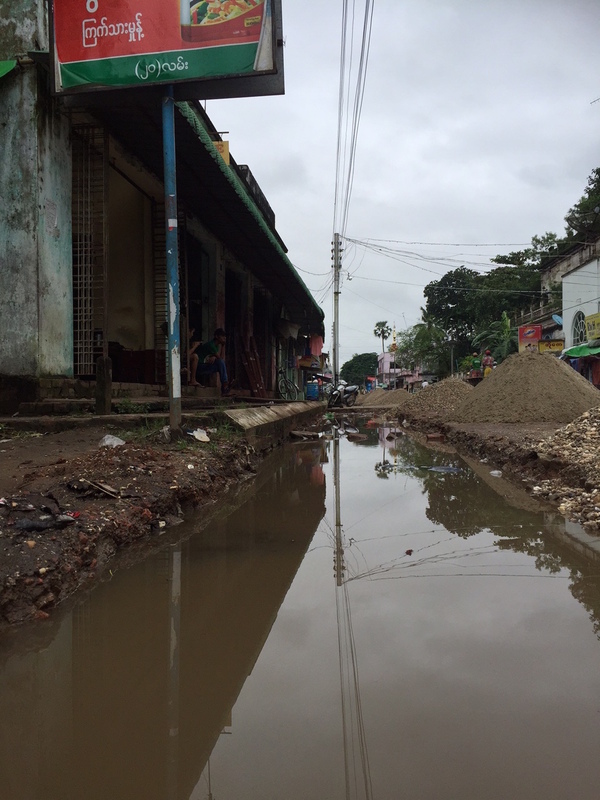 Myanmar is affected by monsoonal rains every year from July to September. The constant rainfall since July has caused a gradual increase in water levels, and people and livestock have become stranded. 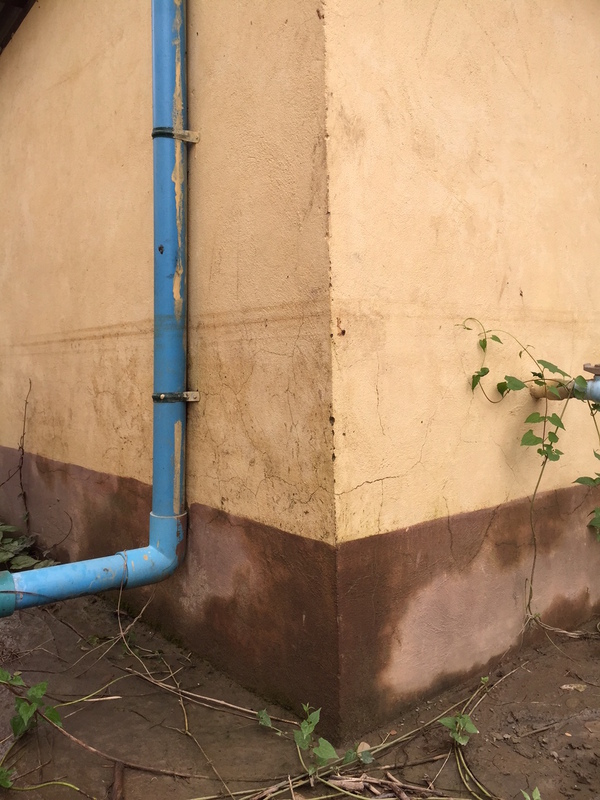 Houses in coastal Nyaungdon have elevated floors to deal with increase of water level but this case it was not sufficient to deal with the extreme rainfall. There is only ten meters difference in elevation between the Irrawaddy River in Myanmar compared with typical rivers in Japan. When they overflow, rapidly moving streams are often caused by upstream rainfall or dam discharge, leading to landslides. 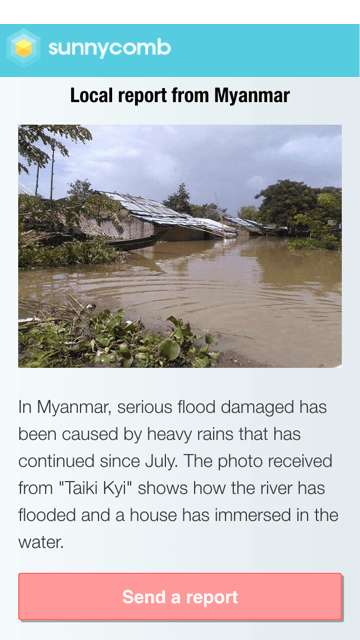 Weathernews has been forecasting torrential rains and supporting flood disasters in Japan for many years, and wants to use our experience here to help mitigate secondary disasters in Myanmar. 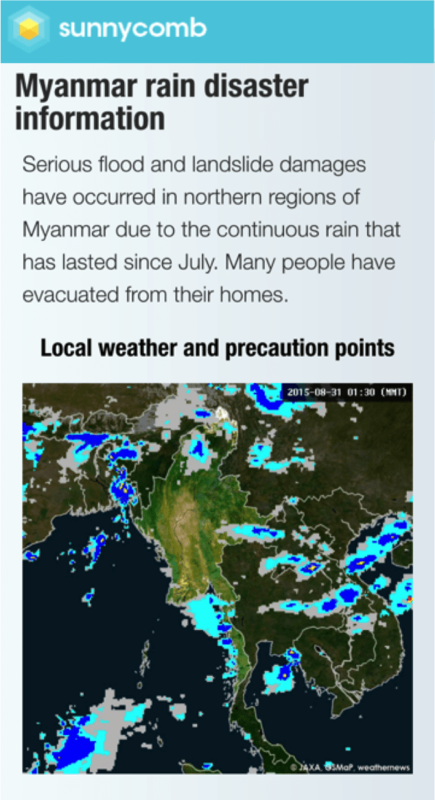 In order to provide support for mitigating secondary disasters and safe evacuation of the local citizens during the peak of the rainy season, Weathernews has released a special Myanmar Rain Disaster Information website and mobile content. 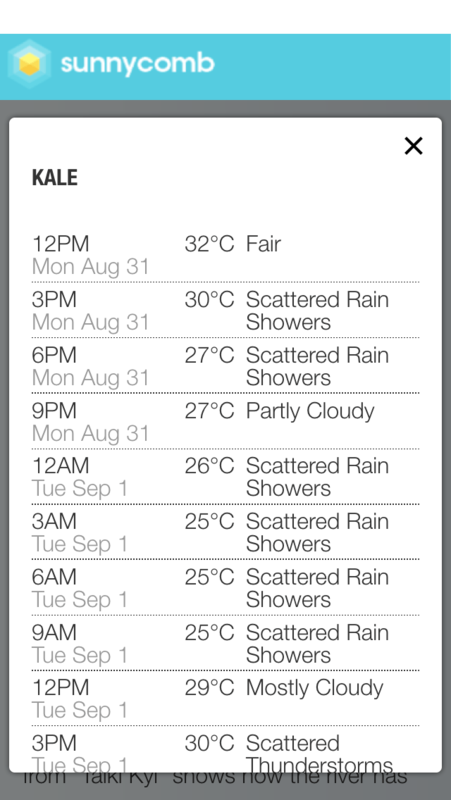 This site consists of weather analysis and forecast by the Weathernews Global Forecast Center, and is available in English and Burmese through the Weathernews smartphone application, Sunnycomb. Weathernews is committed to providing useful weather information to people all the over the globe, and will continue to provide information on the flooding in Myanmar in order to assist the local people and mitigate secondary disasters.